The Bosch IDH182WC-101 18V EC Brushless 1/4 In. and 1/2 In. Socket-Ready Impact Driver wireless packages a professional-grade cordless hammer drill/driver with an 18V Wireless Charging Kit. The IDH182B impact driver provides the operator with the best in torque and versatility, while the kit includes a wireless 4.0 Ah FatPack battery, wireless charger and charging frame, so users have what they need to always be power ready. The impact driver helps users get the job done, with Bosch's Socket-Ready adapter to toggle from 1/4 In. hex and 1/2 In. square drive. With three speed and torque settings powered by a hassle-free EC brushless motor, the tool's hammer-and-anvil system that delivers maximum impact endurance, delivers 1,650 in.-lbs. of torque, making it the most powerful impact driver in its class. The included wireless 4.0 Ah FatPack battery has Bosch's CoolPack technology to give it additional runtime, while the frame helps the charger and battery work smoothly. BLACK+DECKER BDCS20PK 4V MAX Lithium Screwdriver and 42-piece Project Kit is the ideal kit for common DIY projects. This 4V screwdriver features a compact design for access into tight spaces. It also offers an inline grip that provides comfort and control. This screwdriver is compatible with BDCSRAA, BDCSMCA and BDCSOA attachments. The assortment contains the most commonly used hand tools and bits, and it all comes in a convenient carrying bag. Our Evr-GreenTM electric vehicle recharging products and services continue Levitons quality tradition. These innovative solutions will help rapid expansion of the smart grid infrastructure and wide adoption of electric vehicles: a win-win for you and the planet. Whether you are an EV driver, a commercial business, utility company or municipality, there's an Evr-Green solution for you. 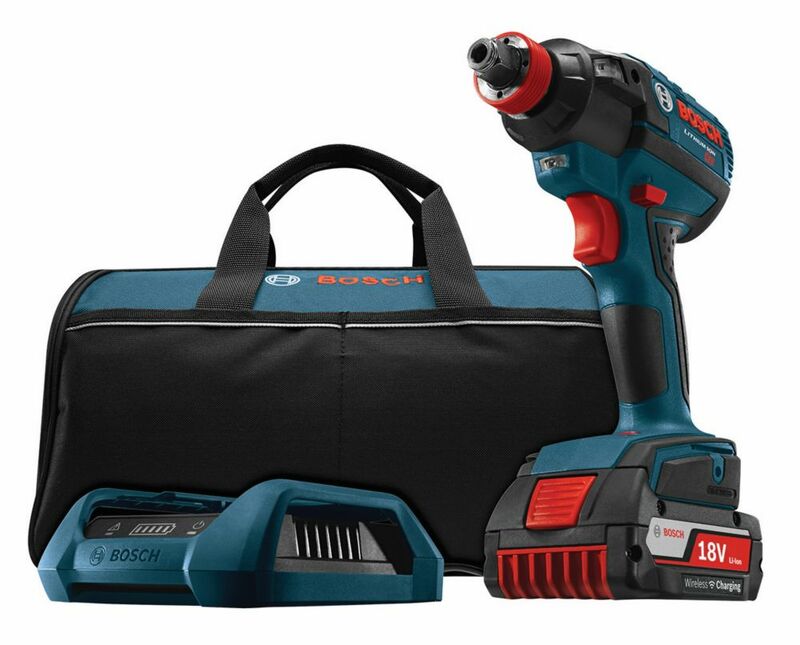 18 V EC Brushless 1/4 Inch Hex and 1/2 Inch Square Socket-Ready Impact Driver Wireless Charging Kit The Bosch IDH182WC-101 18V EC Brushless 1/4 In. and 1/2 In. Socket-Ready Impact Driver wireless packages a professional-grade cordless hammer drill/driver with an 18V Wireless Charging Kit. The IDH182B impact driver provides the operator with the best in torque and versatility, while the kit includes a wireless 4.0 Ah FatPack battery, wireless charger and charging frame, so users have what they need to always be power ready. The impact driver helps users get the job done, with Bosch's Socket-Ready adapter to toggle from 1/4 In. hex and 1/2 In. square drive. With three speed and torque settings powered by a hassle-free EC brushless motor, the tool's hammer-and-anvil system that delivers maximum impact endurance, delivers 1,650 in.-lbs. of torque, making it the most powerful impact driver in its class. The included wireless 4.0 Ah FatPack battery has Bosch's CoolPack technology to give it additional runtime, while the frame helps the charger and battery work smoothly.